This page describes a study of one of many speed-oriented evolution runs. Studying evolution is possible because the simulator can periodically save a gene pool state. Thus we keep track of changes in populations during the evolutionary process. Sometimes it is hard to find the first species with some property, because such a species is usually created between saved "snapshots". This is analogous to the problems of biologists examining fossil records and the punctuated equilibrium phenomenon. Note that this experiment was performed a long time ago and now the following creatures would behave differently due to improvements in simulation. However, you can see their original movement in these movies: 3.3 MB or in high quality: 20 MB. Refer to the publications to read in detail about current research and results. One of the first species which had a moving leg controlled by a touch (T) receptor. 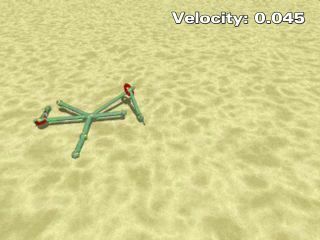 You can find parts of the older ways of locomotion in its genotype. It does not move efficiently, in fact it is merely creeping. After some evolution: the construction and neural network have been cleared from redundant parts. Still not very stable, sometimes drags its "head" on the ground. A bit improved: walking. One neuron, one receptor, one muscle. Touching the ground with the receptor causes bending of a leg. The leg is straightened when the receptor does not touch anything. Quite a good, one-leg creature. The control system has been changed during the evolution, the leg was elongated, the organism is more stable, has some redundant neurons. The first creature with two "legs"! Their coordination is very poor, although the creature is faster than the one with single leg only. After some evolution: the best two-legged creature. Now the coordination of legs is perfect: one is pushing back, the other is pulling.